…Devotee (1): Does anyone have any questions? Please ask. Raise your hand please. Especially a guest. If you have any questions please inquire. Yes? Guest: Who is our mother? Devotee (1): The question was, who is our mother? Prabhupāda: Material nature is our mother. God is our father, and material nature is our mother. That is stated in the Bhagavad-gītā. Just like the father gives the seed of the child within the womb of the mother. Similarly God impregnates this material nature with the living entities, and after that they come out in different forms. So material nature is our mother, and God is our father. These are Sanskrit verses. I know most of you are not conversant with this language, but the significance is that simply by vibration (children crying—aside:) They should leave. Pradyumna: People who have young children, perhaps they could take them away when the lecture is going on so they don’t make noise and disturb people from hearing. Prabhupāda: So simply by vibration the atmosphere will be cleansed and purified. Just like when there is thundering sound in the sky, it does not require to understand by any particular language. That very vibration And the origin of creation is sound. The grosser elements are visible, but the creation takes place from finer elements. The sound is the symptom of the sky. By sound we can understand that there is sky, ether. Then, by sound vibration, there is circulation of air. And you have got practical experience. When there is very loud sound vibration, sometimes there is very strong wind also. So by sound vibration, the wind is started, and by strong wind electricity is produced. From electricity, water is produced, perspiration. And from water, earth is produced. So sound is the original element of creation. In Sanskrit language it is called śabda-brahma. Brahman, or the Absolute Truth, is first appeared Absolute Truth becomes knowable by sound. 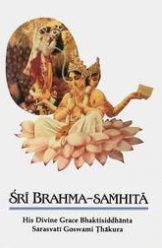 In the Bhagavad-gītā it is said, the Lord says, raso ‘ham apsu kaunteya prabhāsmi śaśi-sūryayoḥ [Bg. 7.8], śabdaḥ khe. Śabda means sound. If we want to see God, so let us hear first of all the sound vibration, because that is the beginning. In the Bible also it is said, “The Lord said, ‘Let there be creation,’ and there was creation.” So “Let there be creation,” this is sound, transcendental sound. So one who says this word, “Let there be creation,” He is not within the creation. Because He, God, is speaking, “Let there be creation” means He is existing before creation. Just like I have already described my body, your body, has a history of janma, or birth, a date of birth. So janma ādi means birth and sustenance and death. We have got this body produced or born at a certain date. It keeps, sustains, for a certain period-say fifty years, sixty years, or a hundred years, utmost—and then again it is destroyed. Therefore janma ādi means birth is also coming from Him, maintained also by Him, and when it is destroyed, it goes unto Him. That is called janma ādi, means birth, maintenance, and annihilation. Janmādy asya [SB 1.1.1]. All this material world, they are undergoing the same process. Janma, sustenance, and end. Everything. This universe also is like that, everything, even the ant’s body or my body, your body, elephant’s body, or there are many demigod’s body. Just like we have learned from Bhagavad-gītā, Brahmā’s body, it keeps for millions and millions of years. One day we cannot calculate. So there are different types of bodies within this material world. We can compare. Just like ant’s body, a fly’s body, and my body. A fly’s body may remain for few years, or, few hours. So our body may remain for few years. And similarly, there are other living entities like Brahmā, their body remains for a few decades. But every body, each body, is subjected to this law of nature: birth, death, disease, and old age. So God’s body is not like that. It is eternal. Here in this material world we can possess a body which may exist for millions of years, but that does not mean it is eternal. It is not eternal. But God’s body is eternal. Therefore, in the Vedic language, when it is said, nirākāra-nirākāra means “who has no form”—it does not mean that God has no form. He has got form, but His form is different from this form upon which you have got experience. Our experience is whatever form we can think of, even Brahma’s form, that is liable to be annihilated. But God’s form is not like that. So when in the Vedic language it is said, nirākāra—means nir, nir means “not,” and ākāra means “form”—that means “God’s form is not like ours.” It is not that He has no form. He has form, but His form is different from ours. And knowledge Now, knowledge, so far our knowledge is concerned, it is very limited. We do not know We can have some experience of our present knowledge, but we do not know what was in the past and what is going to happen in the future. Present also, our knowledge is imperfect. Just like we are seeing the sun daily, but what is our experience? The sun is bigger than this planet, fourteen hundred thousand times bigger. Fourteen hundred thousand pieces of this earthly planet can be thrown into the sun planet, it is so big. Unless it is so big, how it is possible the sun planet is distributing heat and light for millions and millions of years, and although it is situated ninety millions miles? Prabhupāda: Ninety-three million miles away from us, but it is giving us regular heat and light. And heat is so strong that ninety-three millions miles away, still, we cannot tolerate the heat. This is the position of this material world. And we cannot have any perfect knowledge. Therefore our knowledge is imperfect. But God’s knowledge is not imperfect. In the Śrīmad-Bhāgavatam, in the beginning, it is said, janmādy asya yataḥ anvayād itarataś ca artheṣu abhijñaḥ sva-rāṭ [SB 1.1.1]. The description of God: God is the origin of everything. Just like any one of us, we can understand that “My body is generated from my father’s body. My father’s body is generated from my grandfather’s body. My grandfather…” Go on, go on, go on, go on. There must be. It is not that because you cannot see your great-great-great-grandfather, so you cannot say there was no such man as great-great-grandfather. There was or there Similarly, if we go on searching out what is the original father, that is God. Father must be there. Therefore in every religion, God is accepted as the supreme father. The Christian religion also, they say, “O father, give us our daily bread.” So God is accepted, actually He is the father. Must have. We must have original father. You cannot say there is no God. If you are existing, you are existing because of your father. Your father is existing because of his father, his father, his father. There must be somebody original father. That is logical conclusion, not that “I am born out of air” or “My father is born out of air, my grandfather is born…” No. There must be somebody—father. That is given to understand in the Śrīmad-Bhāgavatam that He is the origin of everything. Origin must be there. Anything you take, there must be origin. The modern scientists, they cannot find out the origin. They simply say, “It existed like this.” Wherefrom this existence came? “There was chemicals, hydrogen, oxygen, and mixed up, there was water.” Who put the hydrogen, oxygen? So these answers they cannot give because they have no perfect knowledge. So logical conclusion is there must be somebody, origin. That is God, from whom everything emanates, everything takes birth. Now what is the nature of that origin? He is a stone or living entity? Because we have got two experiences, matter and life. A stone may be very big, but it has no life. But a small ant, although it is very small, it has got life, movement. It has got his independence of moving. That is called life. So if somebody, God or whatever you say, is the origin of everything, then what is the nature of that origin? Is He, is it like a stone or having life force? Naturally we can experience that without God being living, how the living entities are coming? We have got experience that I am a living entity, I am coming out of my father who is also living entity. He is coming of his father, he is also living entity. So how the origin of everything can be a stone-like chunk? No. This is logic. This is philosophy. Therefore Bhāgavata says that janmādy asya yato ‘nvayād itarataś cārtheṣv abhijñaḥ [SB 1.1.1]. Abhijñaḥ means He is full of consciousness, knowledge. Sat cit. Cit means He is living. He is not like a dead stone. That cannot be, because we have no experience that from dead stone life is coming. Sometimes they put argument, taṇḍula-vṛścika-nyāya. In Sanskrit it is called. You have no experience here. In India we have got experience. Sometimes from heap of rice, one scorpion is coming out. So foolish men, they will think that the heap of rice, piles of rice, is giving birth to a scorpion. No, that is not the fact. One who knows the scorpion This animal is very clever. They lay down eggs within the heaps of rice, and by the fermentation of rice, it comes out. So actually, rice is not producing the scorpion. It is coming out under some chemical fermentation process. There are manifestation of living entities. There are different types. Udbhijja. Just like trees, they are coming out of the seed. If the seed is sown on the ground, under favorable conditions it comes out. This is also life. And some of the living entities are coming out of eggs. Aṇḍaja. Aṇḍa means egg. That you know. The birds, they first of all lay down eggs, and then, by fermentation, the life comes out. And some of the living entities are coming out from perspiration. You have got experience, so many bugs. If you keep your beds very unclean, by your perspiration the bugs are grown. It is called svedaja, coming out of perspiration. Svedaja, aṇḍaja, udbhijja, and jarāyuja, and embryo, just like we have come out. So there are different processes of begetting or, I mean to say, giving birth to a living entity. But God is origin, janmādy asya yataḥ [SB 1.1.1]. So He must be cognizant, He must know everything. Otherwise how He can be creator, and He can be origin? But His knowledge is perfect. Just like I am claiming, “It is my body,” but when the body, there is some disarrangement, then I do not know how it has happened. I know that I am eating something, that is going to the stomach, and the stomach, from the stomach many secretion is coming out. That secretion is going to the heart. It is transforming into blood. Again the blood is diffused all over the body. There is a nice mechanical process. But we do not know. Although I am claiming that “It is my body,” I do not know how, internally, my bodily functions are going on. Therefore my knowledge is imperfect, although I am claiming “My body.” But God’s knowledge is not like that. Janmādy asya yataḥ anvayād itarataś ca artheṣu abhijñaḥ [SB 1.1.1]. He knows everything. That is the distinction between God and ourself. I do not know even what is going on within my body. I do not know how my hairs are growing, I do not know how many hairs are on my head, and still, the rascals claim, “I am God.” How much rascaldom it is, you can just imagine. God is not like that. God knows everything. That is God. Anvayād itarataś ca. Indirectly and directly. Directly I can see this is my finger, but I do not know what is the composition of the finger. So direct, indirect. Indirectly I do not know. Directly I can see. So we may have some experience of direct perception, but God has got both direct and indirect perception. We do not know how a flower is coming out, but God knows how the flower is coming out. So in this way, if we study Śrīmad-Bhāgavatam we can understand what is the nature of God. Not we manufacture, but the reason, the philosophy, the authority, is everything there in the Śrīmad-Bhāgavatam. So if we simply scrutinizingly study how, what sort of body God has got. It is a simple language, it is given. Sac-cid-ānanda, and ānanda means blissful. Always blissful. You have seen our Kṛṣṇa, how blissful He is. He is playing on His flute, and His eternal consort, Rādhārāṇī, is there. He’s not blissful? You like, because you are part and parcel of God, therefore you also like that blissful life. You want, young girl wants young boy, and the young boy wants a young girl, live together blissfully. But that is not possible, because it is material world. But the idea comes from God, janmādy asya yataḥ [SB 1.1.1]. Where from this idea came, unless if God the same propensity is there? Love between young girl and young boy. Where from this idea has come in this world? Therefore it is said, janmādy asya yataḥ [SB 1.1.1]. Anything, whatever you see, within your experience, that is in God. We are practically sample of God. Whatever propensities there are in God we have got, because we are part and parcel of God. Just like Atlantic Ocean and a drop of Atlantic Ocean water. Chemically it is the same. If you taste one drop of Atlantic Ocean water it is salty. Immediately direct perception. And if you analyze the whole ocean you will find it is salty. But the difference is the Atlantic Ocean contains millions and trillions of tons of salt, but the drop of water contains a grain of salt. Similarly, whatever propensities you have, that is result of God. If you can study yourself, that is called meditation, study yourself and you will find that you are sample of God. He is vibhu, God is great, and we are small. That is difference. Therefore our knowledge is imperfect. But God’s knowledge is perfect, abhijñaḥ. Abhijñaḥ. Abhijñaḥ means fully conversant. He knows everything. In the Bhagavad-gītā, it is said, vedāhaṁ samatītāni vartmānāni bhaviṣyataḥ [Bg. 7.26]. He knows past, present and future. Because He knows past and present, future of everything, He reminds you. Because God is the Supreme Father, He likes that all His sons, we are all His sons, we go back to Him, back to home, back to Godhead. Just like rich father, if his son comes out of home and suffers for want of so many things, the father becomes very sorry that “This rascal boy has gone out of home, he’s suffering.” So he wishes that “This boy, let him come back home. I have got sufficient means to provide him. Let him be happy.” That is God’s mission. That is natural affection of God. Not that because some of His sons are gone astray God is, God has become poorer. No. He can produce millions and trillions of sons by His desire. And why He’s hankering after one son? That is His affection. That is His kindness. So God is more anxious to take us back to home, back to Godhead. Why? Sac-cid-ānanda-vigrahaḥ [Bs. 5.1]. Ānanda, ānanda means blissfulness. Ānanda, pleasure. You cannot enjoy pleasure alone. It must be many. There must be many. When a man takes the risk of becoming family man He’s alone, there’s no botheration, but he takes the responsibility of maintaining a wife, children and working very hard for maintaining them. Why this botheration? No, this is not botheration. There is pleasure. This is not botheration. Botheration means when I cannot maintain my wife, I cannot maintain children, then it is bother. Otherwise everyone wants that I live in a nice family home with my children, wife and good income, “I shall be very happy”. For this reason one takes the risk marrying. There is pleasure there. Therefore God is never alone. He wants to enjoy pleasure with His sons, family members. We belong to God’s family member, but because we are out from God’s kingdom All these living entities that we are seeing within this material world, we cannot imagine how many living entities are there. How many universes are there. There are millions and trillions of universes, and each and every universe, there are millions and trillions of planets, and each planet there are millions and trillions of living entities. So all of them combined together is only a portion of God’s children. The other children, they’re living in the Kingdom of God. Their number is far, far greater than us. So this is the position. So this Kṛṣṇa Consciousness movement is preaching bhāgavata-dharma. As I have already explained yesterday, Bhagavān, the Supreme Personality of Godhead and bhakta or bhāgavata, our relationship with Him. So it is a very great science of understanding God. So we have decided to discuss this great science for a few days here. You take advantage of it. Try to understand this great science, how we can be related with God and be happy. Because God is sac-cid-ānanda-vigrahaḥ [Bs. 5.1]. He is full of knowledge. He is eternal and He is blissful. We are part and parcel of God. Just like the same example, the drop of Atlantic Ocean water. Although it is a drop, but it must have all the chemical composition. Therefore, although we are very small, in combination to God’s existence, but we have got all the qualities, namely eternity, blissfulness and knowledge. But now it is covered by our material existence, therefore we, instead of eternity, we have to accept death. The death is not mine. I am a spirit soul. The death is of the body. That is called change of dress. Not the man. Changing the dress does not mean the man who is putting on the dress, he is killed. No. Na hanyate hanyamāne śarīre [Bg. 2.20]. The living entity is not destroyed or annihilated after the destruction of this body. He changes, another body. That change takes place because we want it. Future. Our future life is also there. Therefore this life is the opportunity. This human form of life is the opportunity that you may accept next life a sac-cid-ānanda body. Just like God has. That is our original body. It is now covered. So we should attempt in such a way. We should utilize our energy in such a way that after giving up this body we get our original sac-cid-ānanda-vigrahaḥ [Bs. 5.1] body just like God has got, and then again we enter into the Kingdom of God and be happy eternally there. That is bhāgavata culture. Thank you very much. Devotee (1): Does anyone have any questions? Please ask. Raise your hand please. Especially a guest. If you have any questions please inquire. Yes? Prabhupāda: You do not die, your body changes. So you accept another body. Guest: You said, you say that we, our relationship to Kṛṣṇa is as children. But, I’ve also read that we, our relationship is also as, as Kṛṣṇa as our son. Prabhupāda: Yes. Because our business is to love God, so this is very higher conception. There are different stages of love. Love in silence, love in servitorship, love in friendship, love in paternal relationship, love in conjugal relationship. So to accept God as son is a process of loving God. Just like the parents and a small child. Nobody can love the small child better than his parents. Similarly, one who wants to love God, he prays to God, “Kindly you become my child.” So God is so kind, He becomes child of a devotee. Although God is the original Father, but this is a process of loving God. Just like Kṛṣṇa appeared as the son of Mother Yaśodā, because they underwent severe penance in their previous life, both the husband and wife. They underwent severe penance, and Kṛṣṇa appeared before them, “What do you want?” They said, “My dear Lord, we want a child like You.” So God said, “That, where shall I find a child like Me? I shall become your child”. (laughter) That’s it. Guest: You said that God created us because He was lonely. How could God, who is perfect, be lonely? Devotee (1): He said that you say, he said you said that God created us because He waw lonely. Prabhupāda: No, I didn’t say lonely. Guest: Oh, I misunderstood then. 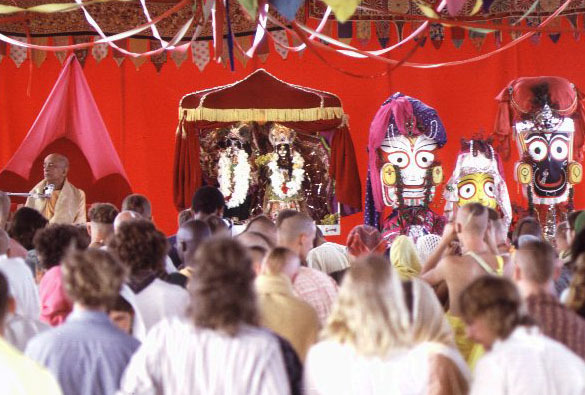 Prabhupāda: God cannot be lonely. Just like as soon as you say that President Nixon is coming, it does not mean he’s coming alone. Because his position as President means whenever he goes he has got his secretaries, his military commanders, so many things. Similarly, God is never alone. God is always with many paraphernalia. So God is not lonely. Never. Guest: You say that we have eternal relationships with the Supreme? Guest: Does that mean that at one time we had this relationship and now we still have it, and then we will still have it later? Prabhupāda: Yes, yes, not once you have it, still. Without God’s grace, you cannot live. You are still, but you have forgotten. Just like a prisoner. A prisoner is put into prison house. That does not mean he has lost his relationship with the state. Before coming to the prison house he was a state citizen, and in the prison also, he is also a state citizen. And the government has concern both ways, when he was free, and when he is in prison. So our relationship with God is not broken, or it cannot be separated. It is there always, but at the present moment, we are covered. We are thinking there is no God. That is our ignorance. Therefore you are suffering. Guest: What is evolution, according to the Vedas? What is this evolution that is talked about by the scientists? Prabhupāda: Evolution means changing of different bodies. The spirit soul is changing from one body to another, and finally he’s coming in the human form of body. This is a chance to know the actual position. And if he takes this chance, he can go back home to, back to Godhead. Otherwise, he is again put into the cycle of birth and death in different species of life. Guest: From what I’ve heard, I’ve heard it explained that the body is made up of many, many different living entities. Guest: Our soul is just like the controlling soul. Can you explain that? Pradyumna: He’s heard it explained that the body is made up of many, many different entities. Living entities. Devotee: …or that each cell is a living entity. Prabhupāda: Yes, all right. What is the wrong there? Guest: Why, why is māyā so very, very strong if our purpose in life is to be with God? Devotee: Why is māyā so strong if our purpose is to be with God? Prabhupāda: Your purpose is not strong. (laughter).